For many years Rare Burgers have been the subject of much debate. Is colour a good indicator? What contamination risks are there? Are rare burgers safe to eat? The main cause of controversy is the fact that burgers are minced and during burger manufacture it is not only the outside of the meat that is exposed to the environment but also the core. This applies even if the meat source is free range or organic. This equates to a risk of bacteria such as E Coli, Salmonella, Campylobacter and Clostridium Perfringens being inside your burger and not being eliminated by a hot cooking surface. The recently launched ‘Industry Guide to Good Hygiene Practice: Catering Guide’ mentions the fact that colour is no longer an acceptable way to ensure against bacteria being present in food. Chefs are aware that sometimes mince can change from pink before reaching temperature and some mince can stay pink after reaching the target temperature. Time and temperature are the new industry buzz words. It is widely recognised that 70°C for 2 minutes OR 75°C for 18 seconds is sufficient to kill all harmful bacteria present in burgers. The Safer Food, Better Business Guide also states meat that has been exposed to bacteria should not be served rare and stresses the need to ensure that meat is steaming hot all the way through. The issue is that this particular source does not mention a target temperature. Would anyone like to guess what the FSA deems steaming hot? 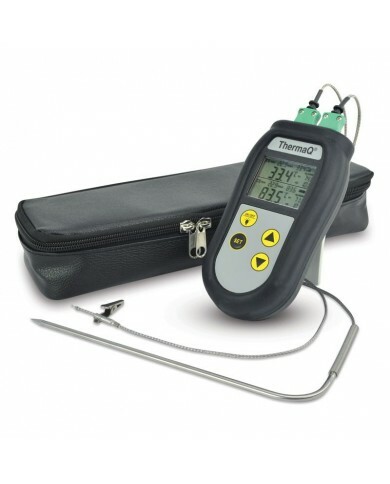 The surest way to eliminate risk is to use an ETI Therma 1 and Burger Probe. 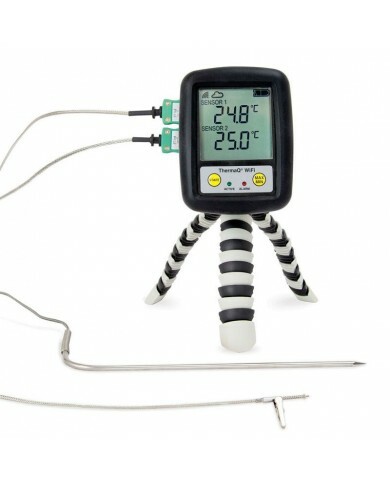 This UK made, calibrated thermometer and specifically designed burger probe will give a temperature measurement with an accuracy of better than ±1°C. The probe tip design incorporates a ‘stop’ built into the probe enabling the user to insert the sensor into the burger to exactly the right depth. This effectively eliminates problems such as taking an inaccurate surface temperature when the probe is not inserted sufficiently or, probing too deeply, resulting in measuring the temperature of the hot plate rather than the burger. For this reason ETI have made the probe available with two tip depths, for different thicknesses of burgers. Probes with 6mm or 12mm tips are available, recommended for burgers between 10 and 30mm in thickness, just select your probe length to suit. ETI have designed the probe with a 45° angled stem making it quick and easy to use. Simply insert your chosen probe into the burger until the ‘stop’ touches the burger surface and you will be guaranteed accurate temperature readings every single time. If you want to serve perfectly cooked burgers that your customers will love, safely and consistently, the Therma 1 and Burger Probe from ETI is the perfect solution.